Welcome to our second 'Research Friday' post, where we look at, comment on, critique and generally tear to pieces research or guidelines that relate directly or loosely to trisomy 18. Please add your comments! This week I wanted to look at a piece that I came across, about the circumstances under which it is permissible to withhold or withdraw treatment from a newborn baby with a disability. As the title suggests, this piece explores when it is permissible to withhold or withdraw treatment from newborns on the grounds of future quality of life. This is highly relevant to trisomy families, as the prevailing view from professionals seems to be that it is permissible to withhold or withdraw treatment from newborns with trisomy 18, although families may be given different justifications for this. Length of life: Children with trisomy 18 should not be given burdensome treatments as they will not live for long: the benefits are short-lived, therefore small, so they do not outweigh the burdens of the treatment. Quality of life: Children with trisomy 18 should not be given treatments that aim to extend their life as their future quality of life is so poor that, even if the treatments are successful, they will not improve the child's life; they will merely prolong suffering. Life itself is not pleasurable, and therefore is not a benefit to these children. This piece primarily explores the 'quality of life' argument rather than the 'length of life' argument. The author argues that the current 'official' view is that treatment may be withheld or withdrawn if the burdens of continuing life for a child outweigh the benefits. He refers to the point at which the burdens of continued life equal the benefits as the zero line. He argues that treatment should be able to be legitimately withheld/withdrawn even above the zero line, within a region he calls the threshold zone. Using the example of a newborn with significant brain damage that will likely result in significant physical and cognitive impairment, Dr Wilkinson shows that the decision to withhold or withdraw treatment is complex. Some such children will go onto have a life worth living, and they and their parents will feel that their quality of life was worth the burdens of treatment. For this reason, some parents will request continuation of life support. However, he points out that if, in the physician's view, the benefits of continued life are likely to be outweighed by the burdens, surely withdrawal of treatment is obligatory, not optional. He states that a 'Threshold' approach, rather than a 'Zero Line' approach, will help physicians make decisions in such complex cases. He goes onto state that, in his view, it is permissible to withhold treatment from infants whose future well-being is predicted to be below a certain level of net well-being that is above the zero line. 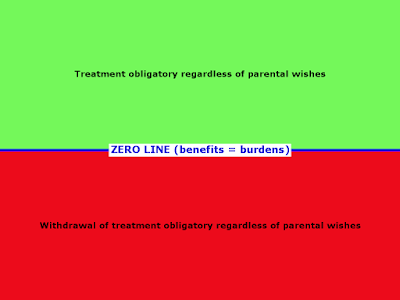 He states that the lower limit of this threshold zone (below which he feels it should be obligatory to withdraw treatment regardless of parental wishes) should be below the zero line. So you can see the zero line in the middle, where the benefits of continued life equal the burdens for the child. The argument in this piece is that there is an upper threshold (the boundary between the yellow and green regions) and a lower threshold (the boundary between yellow and red). Above the upper threshold it is obligatory to continue treatment, regardless of parental wishes. Let's take the example of a child with Down syndrome who needs a heart operation, but whose parents refuse as they do not feel the child would have a life worth living. It is likely that this child would fall above the upper threshold, and treatment would be obligatory despite the parental wish to discontinue treatment. Some children would fall below the lower threshold: the burdens of continued life significantly outweigh the benefits. In this case, the withdrawal of treatment would be obligatory for the physician, even if the parents expressed a wish for continued treatment. 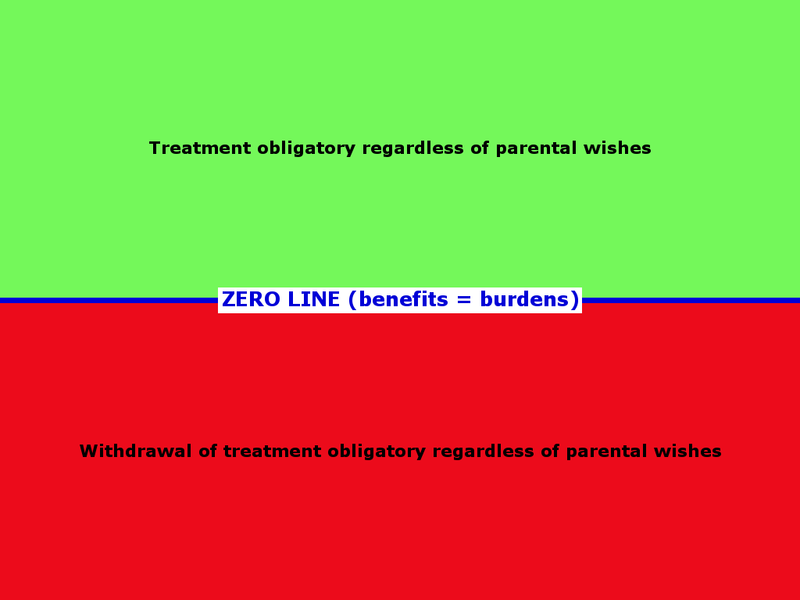 The author argues, however, that around the zero line, both just above it and just below it - so where the benefits minimally outweigh burdens, or burdens minimally outweigh benefits - the decision as to whether to continue or withdraw treatment is made between the parents and physicians, and either choice is ethically permissible. This region (the yellow part of the diagram above) is the aforementioned 'threshold zone'. This is contrary to the more usual Zero Line approach (illustrated below) under which, if a child's condition means that the benefits of continued treatment will outweigh the burdens by even a small amount (ie. the situation falls just above the zero line), then the only ethical choice is to continue treatment, and if a child's condition means that the burdens of continued life just about outweigh the benefits (ie. it falls just below the zero line), then the only ethical choice is to withdraw treatment. It is very difficult to determine whether or not a child's future life will fall below the zero line. Therefore, if we use the zero line as a cut-off for discontinuing treatment, it is possible, indeed likely, that a child who will have a 'life not worth living' (burdens outweigh benefits) will survive. Some children who will have a life that is worth living (benefits outweigh burdens) will be deemed to fall below the zero line and will not survive. The Threshold approach allows parental views on this to be taken into account, rather than using professional judgement as to whether a child falls above or below the zero line. For example, many parents in a borderline case for which physicians suspect that the child will have a 'life not worth living' (but there is a small possibility of a 'life worth living') would consider that treatment should be withdrawn. They would consider it a worse harm to continue treatment and for the child to endure a life of suffering than to withdraw treatment and possibly for the child to miss out on a life worth living. They would prefer to minimise the risk of a low-quality life even though it might mean the child missing out on an adequate quality of life. Other parents may have strong views the other way, believing that it is worth taking even a moderate risk of a child having a low-quality life if there is a chance that the child will in fact have a life of adequate quality. 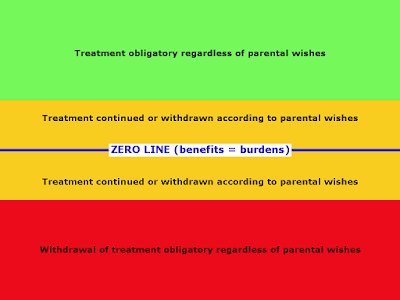 Under the Threshold approach, parents in borderline cases can therefore make the choice to withdraw or continue treatment according to their own values. This means that, in borderline cases, although some children who would have had 'lives worth living' will die and some who end up with 'lives not worth living' will live, parental views can determine the outcome, rather than professionals having to make judgements as to the future in determining which child falls above or below a specific line. It is accepted that caring for a severely impaired child is extremely challenging financially, physically and emotionally for families, as well as having a financial cost for society. The author points out that families' abilities and willingness to care for the child in the long term are in fact taken into account in decision-making about withdrawing or withholding care, and if we are practising the Zero Line approach, they should not be. Under this approach, a child's condition is considered to fall clearly either above or below the zero line, and the family's abilities and willingness should not be taken into account. However, under the Threshold approach, families' abilities and willingness are part of the decision-making process as to whether to withdraw or continue treatment from a child whose condition falls within the threshold zone. This is especially true since some families are unwilling or unable to accept the burdens of caring for a child with a severe impairment, and the cost of caring for this child will fall to society. Caring for a severely impaired individual will necessarily be costly. The author argues that in this case, therefore, even if a child has a life worth living, the burdens to society outweigh the small benefits to the child of continued life. This supports the idea that it is permissible to withdraw treatment from children marginally above the zero line in certain circumstances, eg. when society will be burdened with the child's care. The author argues that the Threshold approach allows for parental rights to decision-making about their children to be exercised. Under the Zero Line approach, parents' views are irrelevant. A physician decides that a child's condition falls above or below the line, and treatment is continued or withdrawn on their assessment only. Under the Threshold approach, within the threshold zone, parental preferences are taken into account. Parents are permitted to make decisions as to what kind of life is tolerable to them and as to whether they are prepared to continue burdensome treatments. They choose whether to take the risk of a 'life not worth living' in the hope of an adequate-quality life, or that of withdrawing treatment, risking the death of a child who would have had a good life, but avoiding the possibility of a child who has a life of suffering. 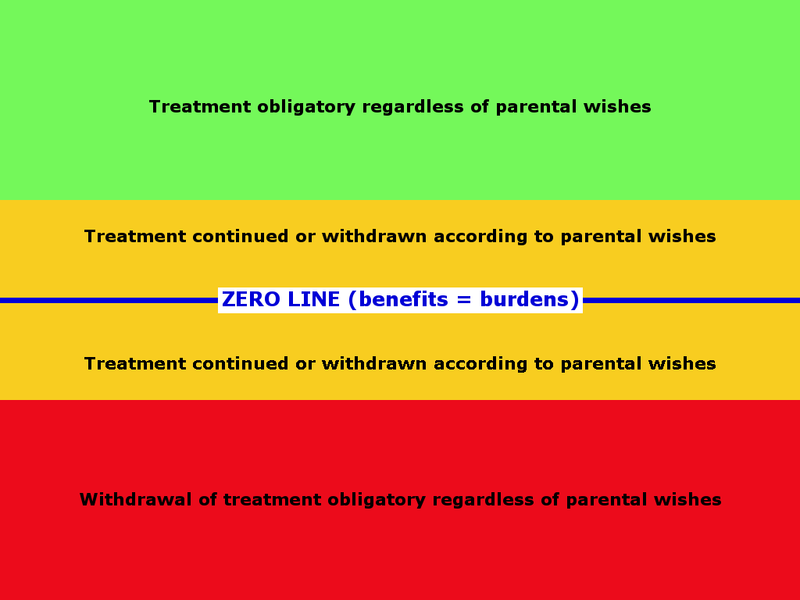 The Zero Line approach is arguably used as the grounds for withdrawing treatment from adults or older children. In fact, often, treatment will be continued even where survival below the zero line is probable. Is permitting withdrawal of treatment above the zero line for newborns a slippery slope? Why treat newborns as a different population to adults and older children? together justify applying a different moral status to this group. If we can withdraw treatment from children who may have a life above the zero line - ie. those who will have a life worth living - this can be seen as promoting discrimination against children with disabilities. However, the author argues that as the threshold is determined by future well-being, this does not constitute discrimination, and that the Zero Line approach could equally be held to constitute discrimination. The author agrees with this point, but adds that the zero line, too, is arbitrary. Also, under the Zero Line approach, what level of certainty does one need to have that a child will have a 'life not worth living' in order to discontinue treatment? He argues that even if the Threshold approach is more arbitrary than the Zero Line approach, the other advantages of it may outweigh this downside. So where should the upper and lower thresholds lie? The author argues that children for whom moderate impairments are predicted - those who will likely walk with assistance devices, be socially interactive, and communicate to the level of basic needs (IQ 35-50) - should fall above the upper threshold, so treatment would be obligatory. Children who will, to a high degree of probability, have multiple severe impairments - especially if combined with ongoing painful illness or medical interventions - should fall below the lower threshold, and withdrawal of treatment should be obligatory. Children who will, to a high degree of probability, have severe physical and/or cognitive impairment are those who fall within the threshold zone, where it is permissible but not obligatory to withdraw treatment. So how is this research useful for trisomy families? the parents' ability and willingness to care for the child. This article is likely to be particularly useful to families who are faced with convincing sceptical physicians, or an ethics committee, that it is ethically reasonable to treat their child. I wish we had found this article when we were trying to make a convincing case for our choice to opt for full treatment being an ethical one. While many of us have found articles that support the prediction that our child will likely have a reasonable quality of life, we are forced to convince physicians that the burdens of treatment do not outweigh the future quality of life. This article will help support the argument that, although this is uncertain for some of our children, although the burdens of treatment will indeed in the end outweigh their quality of life, it should be parental choice that determines whether to take that risk when deciding whether to opt for a given intervention. This article, by acknowledging that it is permissible but not obligatory to withdraw treatment in these cases, also permits physicians some leeway to maintain the feeling that their withdrawal of treatment from children with trisomy 18 in previous cases was also not unethical. That either withholding/withdrawing or initiating/continuing treatment could be an ethical management approach. There are, of course, some children with trisomy 18 with significant multiple physical impairments who will fall below the lower threshold, and for whom withdrawal of treatment should be obligatory. Most parents in this situation, if given honest information, will themselves decide not to initiate or continue treatment. These cases, however, are in the minority. While the Threshold approach does allow more leeway for parental choice, it is still based upon an arbitrary line which is still determined by physicians. There may be an argument that even the smallest possible chance of a life worth living is worth taking; certainly, some families may be willing to take a very high risk of a low-quality life for the chance of an adequate-quality life. Just as some adult patients may choose in theory to be kept on life support in a vegetative state for the very smallest hope of recovery. There is surely an argument that parents should be permitted to take that tiny chance on their child's behalf. This would still allow a threshold approach, but one with a much lower 'lower threshold', where the cut-off would be case of a child with a certainty of no chance of a life worth living. This would be a very low cut-off. Of course, there are significant opposing arguments to having such a low threshold. It certainly would impose a great deal of burdensome suffering on many children for a tiny possibility of an adequate quality life for one child. However, should parents be allowed to take that chance? This perhaps falls to the very complex arguments about who gets to decide on a child's best interests. My personal feeling is that parental views should be paramount in almost all cases, and that assumptions that parents are too 'blinded by love' to consider their child's interests, or are engaged in a 'crusade', reflect medical paternalism more than reality. And when these things do appear to happen, they often owe a great deal to the parents' experiences with, and trust in, medical professionals. However, this is an argument for another day and another time. to care for them, should be taken into account in care continuation or withdrawal decisions, I don't agree with this. I feel strongly that being born into a family that is unwilling or unable to provide care should not impact on decisions as to future care. I believe this does constitute discrimination. Growing up in foster care does not constitute such a burden to a child that it merits discontinuation of care, and society should expect to shoulder the burdens of their care. My personal belief is that this consideration should be disregarded when making 'withdrawal of care' decisions. That even if parents are unable or unwilling to provide care, their views should be paramount. I accept that their ability or willingness to provide care may affect their decision as to whether to pursue continued treatment, but I don't believe it should influence physicians' or courts' decision-making. If we are saying that society cannot afford to shoulder the cost of caring for children for whom parents demand continued life, but are unable or unwilling to care for, we should set the threshold higher (if we are opting for a threshold). Why should the children of richer or more able parents have a greater entitlement to life? However, one could argue that this is a view which simply leads to less parental autonomy, and that part of having the right to make the decision to opt for a life for a child on the borderline is having the responsibility to shoulder the burden of care. If this is the case, if you rely on society to shoulder the burden, surely society should have the right to make the decision too? I think this argument probably also needs more time and space, so again, I think we'll address it another day. However, feel free to add your thoughts. The arguments for a 'Threshold' approach rather than an absolute or 'Zero Line' approach as to where it is permissible to withhold or withdraw treatment for a newborn baby is extremely compelling. There remain issues to address, as perhaps there always will, regardless of how we decide to make these difficult choices. The universal adoption of a Threshold approach for 'withdrawal of care' decisions in the UK would be a benefit for parental autonomy. It would also promote a level of consistency which is definitely lacking at present. However, it does present its own conundrums about where the threshold boundaries should be set. The author suggests that guidance could be produced. I can imagine it would take a long time for physicians to agree on this guidance, and traditional prejudices against conditions like trisomy 18 may well prevail. However, for now, we can use this piece to argue strongly for parental choice as an ethical approach in most cases of trisomy 18. I suggest that all parents facing an ethics committee in order to obtain active treatment read this piece, and incorporate its arguments into their reasoning as to why they should have the right to opt for treatment for their child.